The Presbyterian Church issued a specific apology on Wednesday to former students of a residential school in Kenora, Ont., where medical and nutritional experiments had taken place. 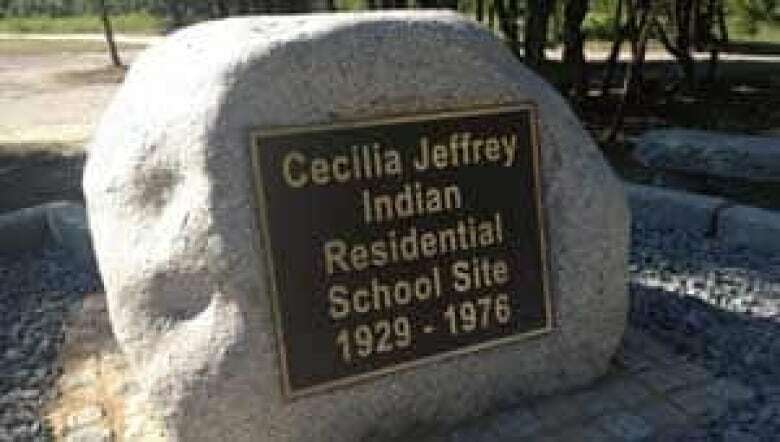 Former students of the Cecilia Jeffrey Indian Residential School attended a commemorative gathering on Wednesday at a memorial where the church-run, government-funded facility once stood. Recently released documents reveal that aboriginal children who were sent to Cecilia Jeffrey were subjected to experimental treatments for ear infections, as well as nutritional and dental experiments that were recently highlighted by a food historian. For some survivors, the latest revelations have compounded the pain they have long felt as a result of the residential school experience. "We had thought that we'd somewhat come to peace with some issues, then there's ongoing revelations of other events happening," said Richard Green, a former student who organized Wednesday's commemorative event. Former students at the ceremony shed tears as they received an apology from the Presbyterian Church. It did not conduct the experiments, but it operated the Cecilia Jeffrey school for a number of years. "I want to acknowledge that at Cecilia Jeffrey, there was physical abuse and sexual abuse and emotional abuse. For that, I am profoundly and deeply sorry," said Peter Bush of the Presbyterian Church in Canada. "We sinned, and I am sorry for that." Bush said the church wants to reassert its apology to residential school survivors and reaffirm its commitment to reconciliation and healing. In the 1940s and '50s, research on the effectiveness of vitamin supplements was carried out — with the federal government's knowledge — on malnourished aboriginal people, including children at Cecilia Jeffrey and five other residential schools across Canada. According to the research by Canadian food historian Ian Mosby, subjects were kept on starvation-level diets and given or denied vitamins, minerals and certain foods. Some dental services were also withheld because researchers thought healthier teeth and gums might skew the results, Mosby found. Aboriginal Affairs Minister Bernard Valcourt confirmed that nutritional experiments did take place in residential schools, calling them "abhorrent examples of the dark pages of the residential schools legacy." Last week, a 1954 report obtained by CBC News found that a doctor and a school nurse experimented with 14 different drugs to treat "ear troubles" in children at the Kenora residential school. The report from the Indian and Northern Health Services archive said some of the children who were treated became deaf. According to the report, children were taught to irrigate their own ears, or the ears of younger children, with hot water. A doctor visited the school on a weekly basis to look out for ear infections "and the recommended medicine was used when possible," the report stated. An official with the federal Aboriginal Affairs Department was invited to speak at the ceremony in Kenora, but no one from the government attended. "It's very disappointing," Green said. "As far as yesterday, we received a call that somebody from Aboriginal Affairs will be in attendance." The federal government has maintained that its apology in 2008 covers the residential school experience as a whole. But Basil Green, another former student at Cecilia Jeffrey, said he was disappointed that the federal government did not provide a specific apology. "They are answerable to the communities, they should've been here," he said. Others, like Richard Green, say they want information on everything that was done to them while they were in the government's care. "I think it's a moral, it's a legal obligation," he said. The federal government has said it has released documents related to the experiments to the Truth and Reconciliation Commission, the body tasked with documenting the residential schools experience.